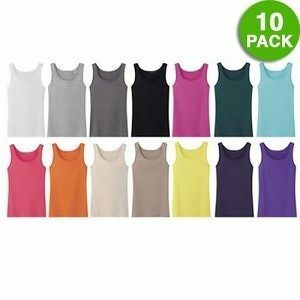 10-Pack: Women's Ribbed 100% Cotton Tank Tops Only $20 Plus FREE Shipping! You are here: Home / Great Deals / 10-Pack: Women’s Ribbed 100% Cotton Tank Tops Only $20 Plus FREE Shipping! 10-Pack: Women’s Ribbed 100% Cotton Tank Tops Only $20 Plus FREE Shipping! No matter the season, no matter the weather, a cotton tank is the one staple in your wardrobe! Layer these 10-Pack: Women’s Ribbed 100% Cotton Tank Tops Only $20 Plus FREE Shipping under blouses, sweaters, and jackets during fall and winter; then wear one on its own to show off your tan in the spring and summer!